Note: this post is the English translation of the previous release in Japanese. In October, 2012, I got a chance to hear from two ex-members of Commodore Japan, Mr. Ieda who had taken charge of working of manuals and Mr. N [alias] who had taken charge of designing machines, due to amazing coincidence. Both still remember the time that Commodore Japan, Japanese arm of Commodore International, was developing and manufacturing Commodore 64 and its successors. Firstly, when hearing they had been around 30 years old at that time of entering the company, I heaved a heavy sigh of wonderment. This article is a reconstruction of the story I heard from the two at that time, referring to Brian Bagnall’s Commodore: A Company on the Edge published in 2010 with thinking back on the night. The voluminous book traces the history of Commodore company from the foundation to the year 1984. Though the author is young person born in 1972, he made the original of the book titled On the Edge: the Spectacular Rise and Fall of Commodore public, as early as 2005 and then have led the study on Commodore. I also mention that another book titled Programming Lego Mindstorms with Java by Bagnall is translated into Japanese from CQ Publishing. In addition to this, I consulted the mail interview with Miachael Tomczyk called “What was Japan for Commodore?,” which had been conducted by hally and published at VORC in 2003, both prior to and after the talk. Tomczyk was an assistant to Jack Tramiel at Commodore International. I am a late Commodore newbie who found out about it via the music which the machine has played and the SID chip in it, but nevertheless, Mr. Ieda and Mr. N responded to my precarious words in a courteous way the whole time. I just acknowledge Messrs. Ieda and N for their great favor and tolerance. Mr. Ieda joined Commodore Japan just before the development of VIC-1001 which came on the foreign market as VIC-20 (Taro ‘Tony’ Tokai gave the name to it), and later wrote a user’s manual provided a Japanese version of Commodore 64 (see the blog post called “Today’s One Cup of Sake ‘I am a secretary to you. What do you do?’ Part 1” written by 2011deko), teaching himself the machine. Gathering from the cover, it is based on well-known Commodore 64 User’s Guide. He enlarged the original text for Japanese Commodore 64 in parallel with translating it. The result was over 300 pages. It’s amazing that the number of copies printed was almost 3,000 at that time regardless of his efforts. Mr. Ieda changed to his career from an agent of editing encyclopedias in order to take charge of producing manuals in Commodore Japan. And He wrote and revised the manuals of software and hardware sold by Commodore Japan down to the Amiga era. It is notable that the manuals of VIC-1001 and peripherals like printers and floppy disk drives, including English editions, were produced in Japan. Especially, the manual of VIC-1001 was written by Taro Tokai, the general manager of Commodore Japan, without the English manual. Because the machine was sold earlier than United States. 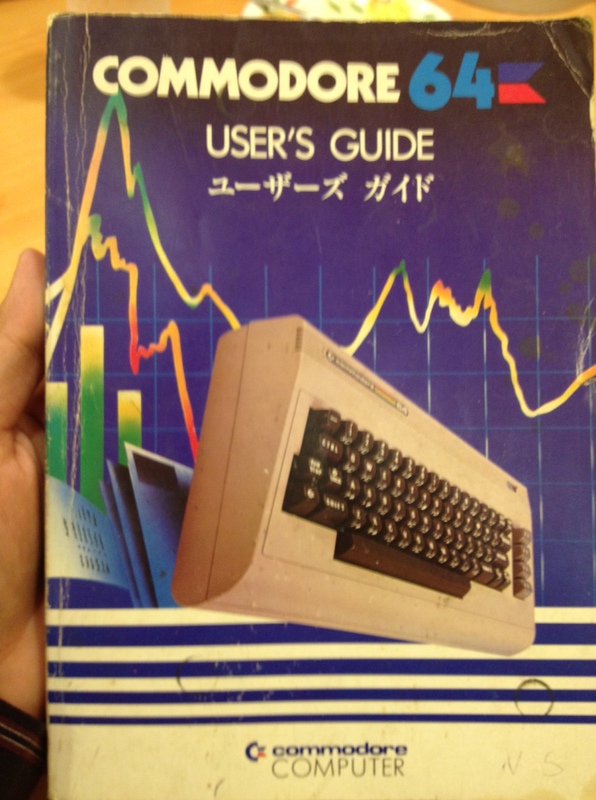 The cover of Commodore 64 User’s Guide (Japanese edition). ◎All were written by Mr. Ieda. The back cover of Commodore 64 User’s Guide (Japanese edition). ◎The address of Home Computer Co., Ltd, the selling agency, is the same as the sales division of Commodore Japan. In Commodore Japan, the Japanese user’s manual written by him was an indispensable document to be read in the first place for new employees including Mr. N at that time. 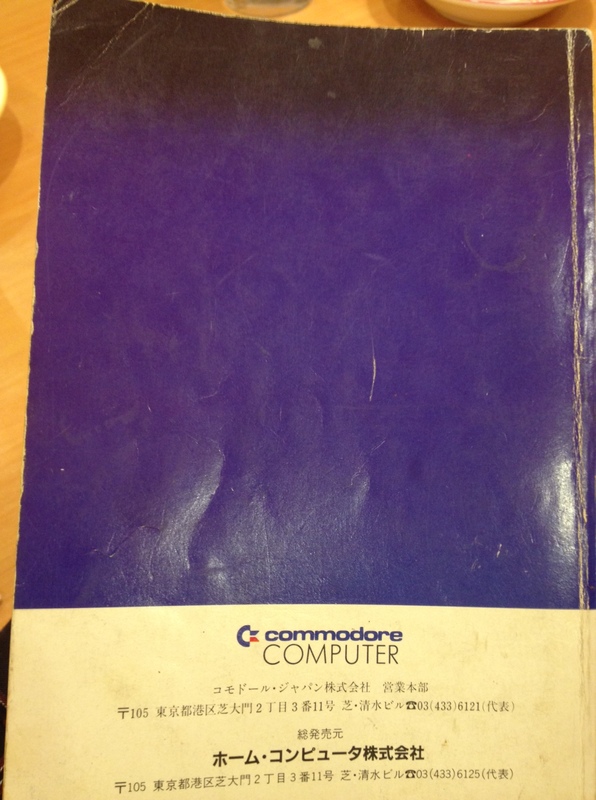 Simply considering the volume, that is one and only book on Commodore 64 in Japanese language. But it is a great pity that Commodore 64 didn’t capture enough users in Japan, so that the contents were commonly unknown. I couldn’t feel anything but Mr. Ieda’s tenacity as a professional and passion for the subject of work when borrowing it from him on the scene. Because it was corrected every here and there the typographical errors and the mistakes of example programs which he has founded after the publication programs with a red pen. 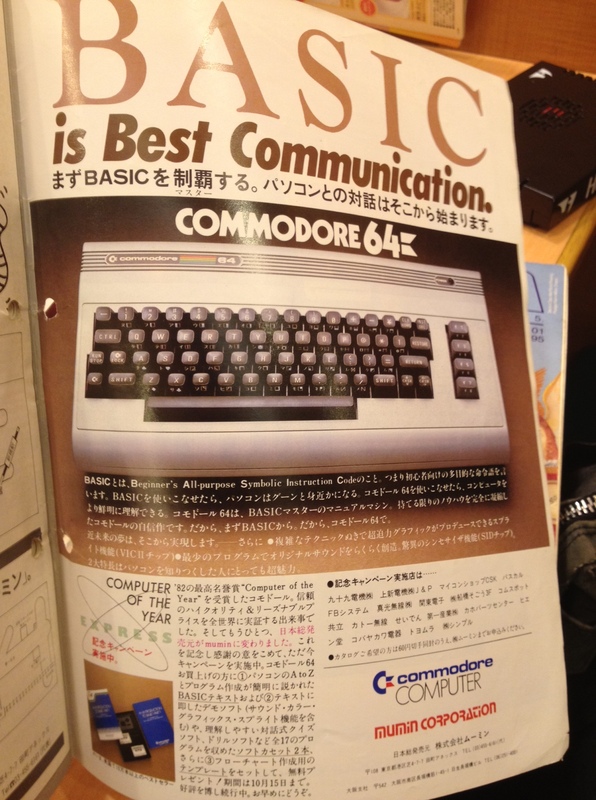 Japanese Commodore 64 firstly introduced JIS 8-bit code in accordance with Mr. Ieda’s proposal as katakana wasn’t aiueo-order (imagine that ASCII wasn’t alphabetical order) in the previous Japanese PET/CBM machines. Also graphical characters used in PET/CBM were revised so that they were regular sequence on the keyboard. When Commodore 64 sold explosively in the English-speaking world, however, character corruption occurred on the screen since they were different between English and Japanese. It’s for this reason that there was a plan to enable Japanese Commodore 64 to select between Japanese and English modes with DIP switch by mounting dual ROM in it. But it never took place. Although modern Commodore 64 emulators like VICE have well approached to the satisfactory level, they can’t simulate Japanese Commodore 64 yet. The first TV series of magical girl anime Magical Princess Minky Momo produced by Ashi Production began to be broadcasted in 1982. Probably, the title was chosen among contemporary cultures of the time to attract boy’s and girl’s interest (!). He said that he didn’t have no idea whether Minky Momo had been known through the test/demo disk. It may be an interesting topic. ◎MOS Technology SID is already treated as a synthesizer in the manual (compare this point to the original Commodore 64 User’s Guide). It’s not a fact that the production system of manufactured goods in Commodore company was like that all was produced by the members in U.S. and then they were modified for the Japanese market by Japanese team. The general manager of Commodore Japan, Taro Tokai and an engineer, Yash Terakura worked with new-developed products since the late 1970s, traveling between U.S. and Japan. So ex-engineers belonged to Commodore International still remember their names. According to Mr. N, Commodore 64 was manufactured more than 240,000 per month and the production volume in a factory was up to about 50,000. The main factor of the limit was about die and mold. The development team had been flying about for production inspection. As for the number of members in Commodore Japan, there were about 80 (30 of them were engaged in implementation design) in the Tokyo headquarters and 200 if including the staff at related factories. Then, were there only business travelers from Japan? Mr. N, who had taken charge of case design and mechanical design, revealed details about this. Ira Velinsky worked under Jack Tramiel as a designer both in his Commodore and Atari days. He designed the case of Max Machine, a variant of Commodore 64 aimed at a game console. Also, when Jack Tramiel canceled the design of CBM-II worked by the designer belonged to German company Porsche A.G., since it had problems on the structure and became more expensive, Velinsky re-designed it instead of him, and entered Commodore International after that. He talked to his co-workers about the episode in the Tokyo office. But in those days Mr. N and the others only half believed that Porsche had designed Commodore products. Furthermore, he has another episode that he changed the shape of connector on TED, a successor of Commodore 64, for a design reason. Unfortunately, hard worker Velinsky died of a heart attack when traveling by airplane in 2000. His fellow Commodore designer Bil Herd also looks back on this on Commodore Plus / 4 World. The controversial case designing had been worked out by Ira Velinsky, who also designed the Plus/4 case. Ira moved to Atari in the mid-80s and was the designer on the ST and XE computers as well. Mr. Ieda brought The Transactor Magazine and VIC! with Commodore 64 to me (as for the former, some issues are not introduced below). 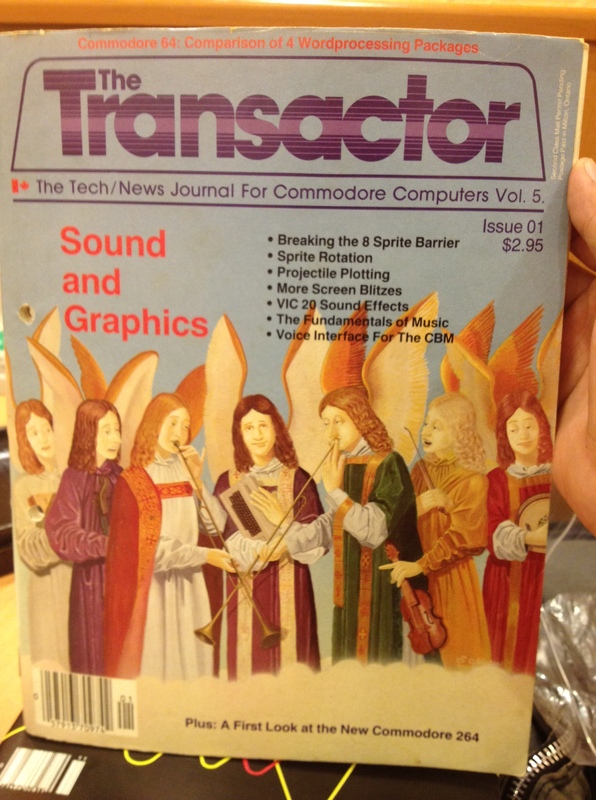 When I picked up some issues of Transactor, I immediately noticed that there were feature articles corresponded to common “how to make music on your computer.” There were some guides for us to compose with BASIC before tools with front-end became popular. We must not overlook not a few songs made with BASIC in High Voltage SID Collection. The specifications of SID were mainly written by Paul Higginbottom (for example, see “Making Friends With Sid – introduction to making musing with the C64 sound chip” in Vol.4, Issue 02. By the way, the letters “Special: Commodore 64 SID Sound Unleashed!” were printed in the cover of this issue). We can listen to Bach’s Prelude in C Major programmed by him if we feel like it. Additionally, all issues of Transactor are available on Craig Bruce’s site at present day. ◎There is the section dealing with programs contributed by the readers. The other magazine Mr. Ieda brought was VIC! with Commodore 64. 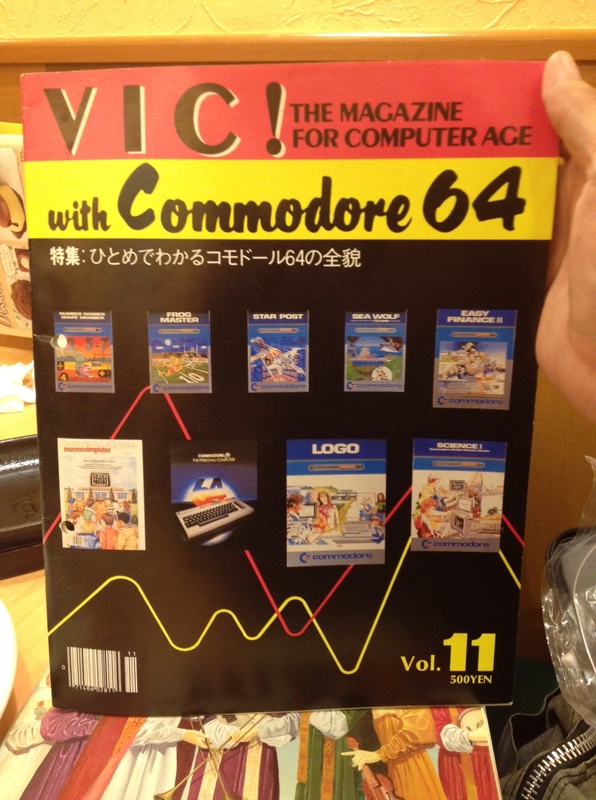 This was the special issue of VIC!, which was a promotion magazine published by Commodore Japan. 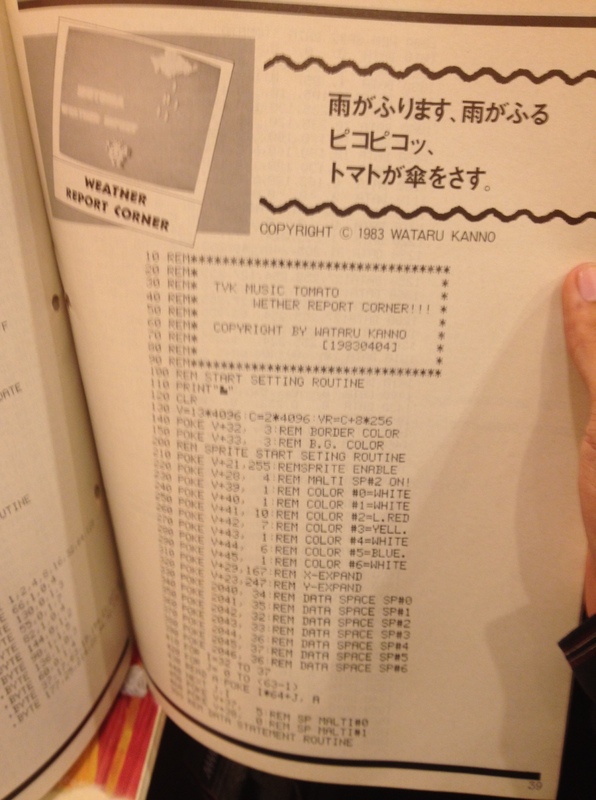 When scanning it, I am also surprised that there is the section dealing with programs contributed by the readers like Mycom BASIC Magazine [one of popular computer magazines in Japan. We usually call it “Be-maga”] published by Dempa Shinbunsha (all programs in the former are written in Commodore BASIC, of course). I could make sure VIC! with Commodore 64 also focused on music in BASIC just like Be-maga, which was a pioneer of the place where we could showed our programming music (see “Speculative Scribble on I and Chiptune” [in Japanese] written by WizardOfPSG). Perhaps foreign Commodore users and hobbyists as well as crew of High Voltage SID Collecion may not know this fact. Maybe it is an unromantic question, but actually, how many contributed programs were written by real readers, not the editorial desk in VIC! with Commodore 64? Home computer and coin-op arcade have repeated innovation since the late 1970s. I will show the two years 1977 and 1978 as a merkmal on trial here: Commodore PET was launched in 1977 and Taito Space Invaders was released in 1978. And of course, video game consoles for home use should be also noted here. These three were not unrelated each other. Popular arcade games have been ported to contemporary home computer and console platforms. The former always had the advantage of hardware, so this is why, the process of conversion turned out a challenge by necessity. We might say that Japanese people like me have encountered these converted arcade games entirely through out Family Computer (released as Nintendo Entertainment System except in Japan) as far as a field of 8-bit platforms. But if we broaden our minds to the world, we can make sure that arcade games have been “expanded” to more platforms. Incredible amount of conversions from arcade games were released on such as Commodore 64, Atari 8-bit, ZX Spectrum, and Amstrad CPC and short period of time for porting them confirm that they absolutely worked as moments for purchasing to consumers. Then, firstly we have to mention HAL Laboratory in the context because the development company involved in work of conversion since as early as 1980 (officially). It is also the company which Satoru Iwata, the current CEO (2002-) of Nintendo, firstly entered and took up the post of president in 1992. It was surprised to me that I found the name of “HAL Laboratory” among video game development companies for Commodore 64. In the interview above, hally of VORC describes that the level of conversion worked by HAL Laboratory stood out on a global scale. Can you tell something about HAL Laboratory from Japan? Apparently, many of early VIC-1001 cartridges were programmed by them. (At least the following titles have been confirmed: Jupiter Lander, Star Battle, Poker, Road Race and Money Wars. I guess Jelly Monsters, Alien, Mole Attack and Slot might be as well.) Although nowadays they’re a popular video game company which is strongly connected to Nintendo, at that time HAL Laboratory was very young and small. The company had been established with a few associates just seven months before the VIC-1001 was announced. Why was HAL Laboratory given important posts from Commodore? When I asked the two about the company, they told me it had closely involved in Commodore Japan until the time of CBM (i.e. PET/CBM or before the release of CBM-II and VIC-1001) – there is a two-shot photograph of Yash Terakura, an ex-engineer of Commodore Japan, and Iwata in Bagnall’s book. When Terakura was developing the next model of PET (today known as Colour PET) by order of Tramiel, some adolescents who had a PET got collected, and then suddenly, the Tokyo office began to work as a place of intern (or a gathering site) for future engineers. Among them, of course there were Iwata who was enrolled in Department of Engineering, Tokyo Institute of Technology at that time, and besides, Kazuhiko Nishi. Eventually, the five persons of this group grew to the founders of HAL Laboratory. Brian Bagnall: Commodore: A Company on the Edge (2nd ed. ), Winnipeg Manitoba: Variant Press, 2010, p. 225. As said before, why could HAL Laboratory have the excellent development capabilities even if they were very young? It seems some ex-crew of Commodore International such as Andy Finkel, Michael Tomczyk, and Neil Harris also shares this understanding. I think one main reason is that they had advanced developing environment for VIC-1001 than the usual with the cooperation of Commodore Japan. Let me quote the corresponding part about this from Bagnall’s book even though it is a bit long. The programmers were particularly taken by a game called Pakkuman, first released in Japan on May 22, 1980. […] “What happened was a group of Japanese programmers got really frustrated that they couldn’t have Pac-Man on the computers,” recalls Michael Tomczyk. Each programmer focused on developing an arcade version of a game for the VIC-1001, with much attention spent on Pac-Man. “We worked until midnight or later everｙ night,” says Iwata. Tony Tokai made sure the HAL programmers had every versions of the VIC-1001 so they could bring them back to their rented apartment in the Akihabara section of Tokyo and program games through all hours of the night. The developers used an interface to connect the VIC-20 cartridge slot to the PET computer so that the cartridge could load right from the expanded PET memory. When done coding the game, they burned the code to a ROM chip and placed it into a cartridge. “They turned Pac-Man into a VIC-20 game on a cartridge,” says Tomczyk. The young HAL Laboratory programmers also made conversions of the most popular arcade games of the day by Atari, Namco, and Taito–Space Invaders, Avalanche, Galaxian, Night Driver, Rally-X, and Lunar Lander. HAL Laboratory pushed the graphics and sound of the VIC-20 to the limit, producing accurate reproductions of the original games. “The Japanese folks were doing basically perfect clones of arcade games,” marvels Commodore software developer Neil Harris. Brian Bagnall: Commodore: A Company on the Edge (2nd ed. ), Winnipeg Manitoba: Variant Press, 2010, p. 278. According to the two, HAL Laboratory became less involved with Commodore Japan after it was founded in 1980. They also recognized that the company had some experienced programmers at that time. To the contrary, Commodore Japan suffered from a shortage of programmers (i.e. they were no good at software development). 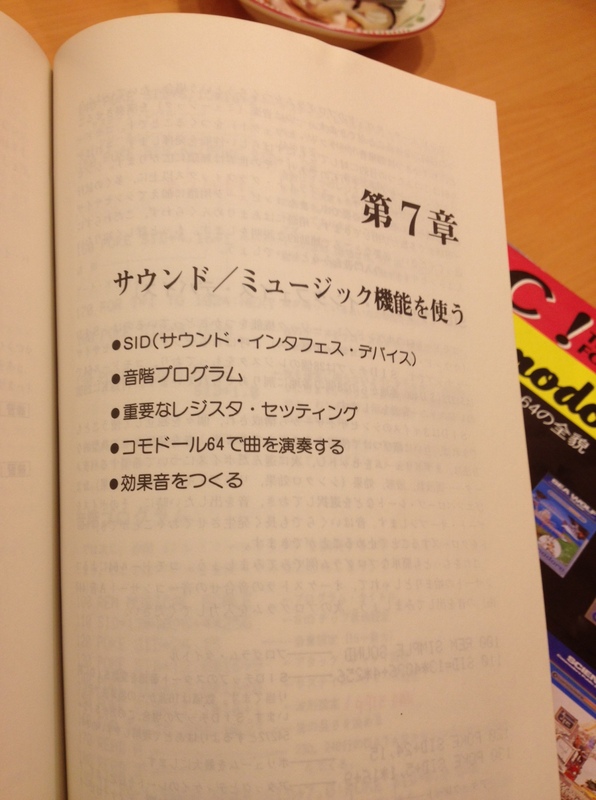 Also Mr. Ieda said that Satoru Iwata should have translated a sort of manuals of 6502. This is an important hint for reconsidering about the facts above. MOS Technology 6502 commonly known as 6502 is a CPU gets abreast of Z80 underpinned a lot of 8-bit great machines. It was used in home computer such as Apple II, BBC Micro, PET, and VIC-20. Family Computer and PC Engine (released as TurboGrafx-16 in U.S.) also used its variations. And now what was “a sort of manuals of 6502” that Iwata translated? I can’t get over that it was a document about KIM-1, which was a single board computer MOS Technology developed in 1976. Probably it was a datasheet like SY6500/MCS6500 Microcomputer Family Programming Manual by Synertek. By the way, we can’t hear that where Taro ‘Tony’ Tokai, ex-general manager of Commodore Japan and ex-president of Atari Japan, is today and how he is doing. There is no definitive information about them at least on the web. I asked Mr. Ieda and Mr. N, but they didn’t know that after all. Bagnall describes about the history of Commodore Japan, referring to the interview with Yash Terakura in his book, however, it seems that he couldn’t get into touch with Tokai. Mr. N told me one thing that he had gotten into a car accident after the assuming the president of Atari Japan. If you know about what he is doing, I would appreciate it if you could inform me that. Added (2014/11/05): On November 11 2011, just one year passed since I published the original text in Japanese. I found that Yash Terakura provided a comment on it. The matter was Taro Tokai has passed away. Robby Boey, the administrator of MOS 6502 (blog name), also announced the fact on another blog run by him on November 7. So I lost an opportunity for hearing his Commodore Japan and Atari Japan days from Taro Tokai himself. This was/is a very strange and sad experience to me. If you guess that Commodore Japan was only a distributor which sold Commodore products developed in U.S., maybe you need to change this idea. Because there were products factories world around and development team had highly respectable internationality. First of all, shuttling between U.S. and Japan, their efforts of trying to root “Japanese (language) Commodore” had been vividly inscribed in some models released since VIC-1001. Mr. N told me a singular “parallax” experience he has felt. When developing C128, he was traveling between U.S. and Hong Kong (he has also visited a factory of MOS Technology sometime). Once, he suddenly experienced that Commodore Japan was just like a production base for the head office in America in order to act as an agent for Hong Kong. Japanese Commodore didn’t sell in huge numbers in the end. How did the management team position the selling of Commodore products in Japan in their world strategy? And how was it modified? I think that hally’s interview with Tomczyk shows one answer, but I felt like strongly listening to recollection by more other persons who worked in the field, hearing from Mr. N and Mr. Ieda. I acknowledge Mr. Ieda and Mr. N because they accepted the talk I suddenly proposed and still have a relationship with Commodore. This may sound exaggerated, but it is an invaluable “gift” for followers that ancestors don’t forget their work they have achieved. Also I deeply thank hally, tappy, and Kayama. for giving warm encouragement and advice to me in going to the talk, even though I had recently acquainted with you. ・2012/11/11: Released the original text. ・2012/11/19: Proofread by Mr. Ieda. Corrected throughout the full text and added some sentences including important facts. He informed and added the types of manuals he worked, Dual ROM, and the history of Ira Velinsky. ・2012/11/21: Corrected the places Mr. N pointed out (i.e. the number of employees at the Tokyo office in Commodore Japan, the fact that his overseas business trip was at the time of developing C128, not C64, and so on). ・2014/11/05: Released the English translation. Slightly touched up the original text. ・Brian Bagnall: Commodore: A Company on the Edge (2nd ed. ), Winnipeg Manitoba: Variant Press, 2010. 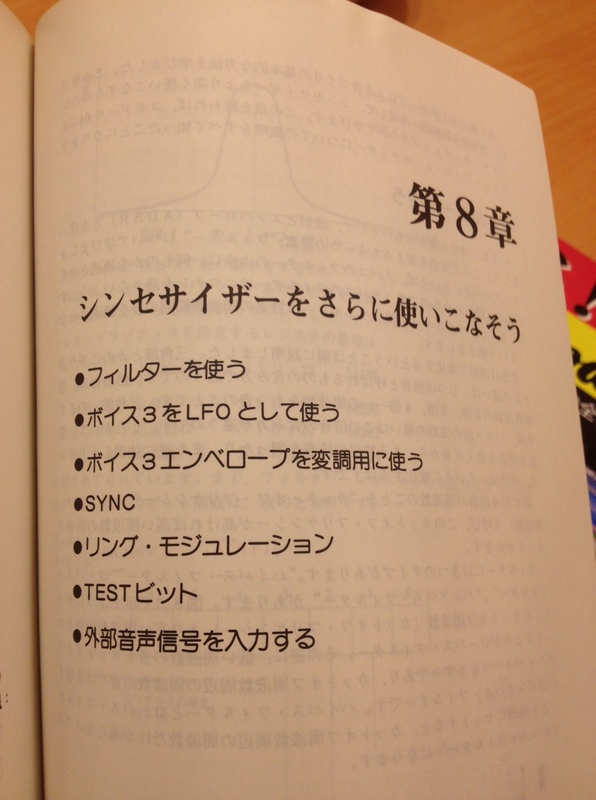 In an ironic twist, my wife translated the Japanese VIC-20 users guide to English for the US introduction. John Feagans, the legend came here! i’d like to know your contact. I wonder who designed the VIC-1001, later VIC-20 case. Most obvious answer would be Ira Velinsky since he is kind-of credited for the rounded prototype PET 2001 case already in 1976/77-ish (which Commodore simplified to an sharp edged one). As noted Velinsky is also credited for the UltiMAX case in 1981/82-ish, which to some part is based on the VIC/C64 design and that he has yet another number of Commodore references under his belt, like the redesigned CBM-II series cases for which he won a design award (I still haven’t understood if he based those on the impractical Porsche design or made them from own ideas and the previously rounded PET). Yet I read on another forum several years ago about someone whose teacher claimed he was the designer of the C64 case specifically, and that teacher was not Velinsky. Unless he referred to the flat C64C design, it suggests that individual either modified an existing VIC design, is the missing person I’m looking for or would just make up an story to impress his students.